IMAGE: Owner of Defunct Amusement Park | Alpine, TX | 1-Person Household | Former WW II Prisoner of War | 2007. 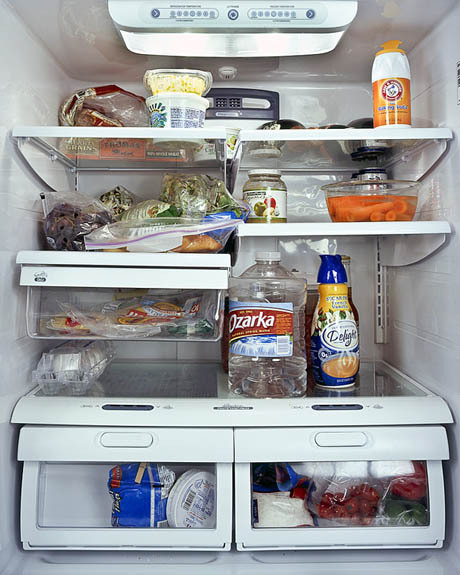 From You Are What You Eat by Mark Menjivar, “a series of portraits made by examining the interiors of refrigerators in homes across the United States.” Found via GOOD, where you can see many more photos from the series. 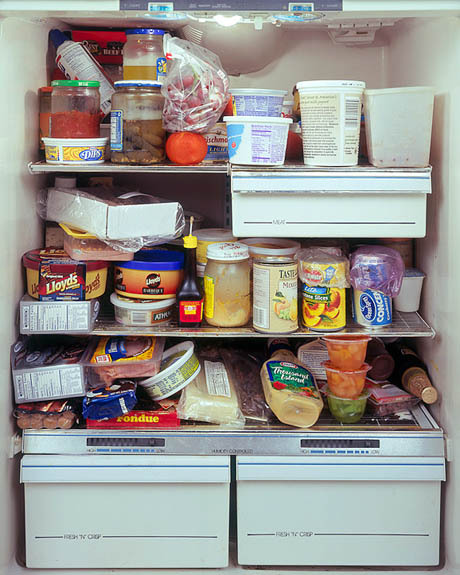 In America, 99.5% of households own at least one fridge. For many people who hear that statement, the surprising news is that 0.5% (1,520,299 households) don’t! What do those people do? Food processors, dishwashers, even ovens: most kitchen appliances seem totally optional. But living without a refrigerator seems slightly insane, if not completely impossible. Of course, such dependence wasn’t always the case (nor is it still, in many parts of the world). In her excellent book, Fresh, Susanne Freidberg describes the inauspicious origins of the artificial cold chain, from ice plant infernos to frigoriphobie (the French refrigeration industry’s term for widespread public antipathy to cold storage). During the first half of the twentieth century, however, the combination of technological advances, war (during World War One, Europeans relied on beef imported in refrigerated steamships to meet demand, while patriotic Americans were urged to conserve food and save leftovers using an icebox), urbanisation and suburbanisation, lifestyle changes, and sustained, pervasive marketing (“Kelvinated foods just fairly coax midsummer appetites!”) meant that by 1940, more than half of American households owned a refrigerator. IMAGE: Midwife/Middle School Science Teacher | San Antonio, TX | 3-Person Household (including dog) | First week after deciding to eat locally grown vegetables | 2008. IMAGE: Bar Tender | San Antonio, TX | 1-Person Household | Goes to sleep at 8AM and wakes up at 4PM daily | 2008. 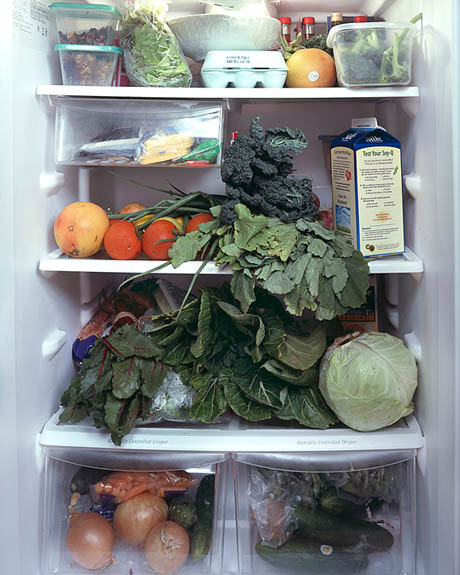 Both images from You Are What You Eat by Mark Menjivar, “a series of portraits made by examining the interiors of refrigerators in homes across the United States.” Found via GOOD. If the stupendous system of food preservation […] which supports us were interfered with, even for a short time, our present daily existence would become unworkable. Cities with thousands of inhabitants would fade away. We would probably turn into beasts in our frantic struggles to reach the source of supply. It is not extravagant to say that our present form of civilization is dependent upon refrigeration. The refrigerated cold chain played a huge role in reshaping the geography of food, removing the constraints of season, climate, and proximity in favour of monocultural economies of scale, astronomical food mileage, and permanent global summertime. Freidberg’s book, however, concentrates on another, equally fascinating, impact of artificial refrigeration and food preservation: the ways in which they blurred “the known physics of freshness,” and undermined “traditional understandings of food quality related to time, season, and place,” creating a widespread mistrust, misrepresentation, and misunderstanding of “fresh” food that persists today. IMAGE: Graphic Designer/Print Shop Owner | 2-Person Household | Founder of www.DeliverUsFromLiberals.com | 2008. 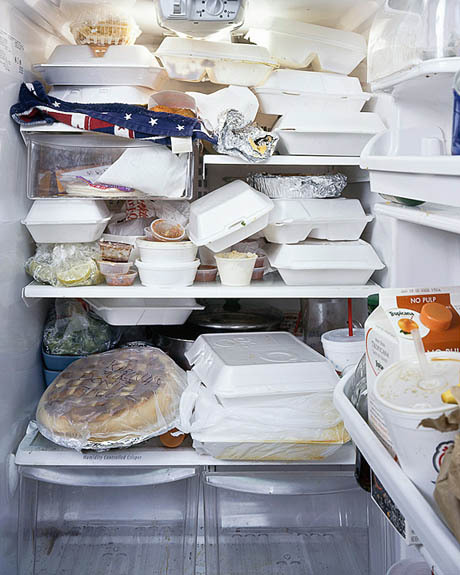 From You Are What You Eat by Mark Menjivar, “a series of portraits made by examining the interiors of refrigerators in homes across the United States.” Found via GOOD. 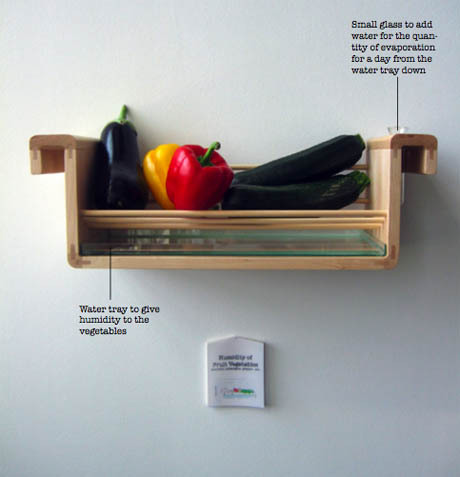 It is that lost knowledge about fresh food – what it should look like, how long it should last, how we should treat it – that designer Jihyun Ryou wanted to reintroduce in her thesis project at Design Academy Eindhoven, Save Food From The Refrigerator. Ryou’s initial research brought her to the same starting point as Susanne Freidberg: artificial refrigeration has radically redefined our relationship with fresh food, and not necessarily for the better. 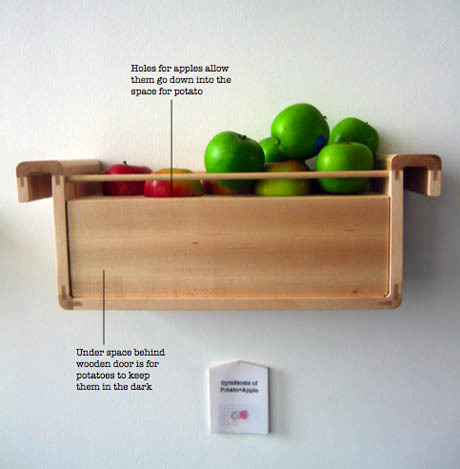 Her solution is a set of ingenious, wall-mounted storage units that draw on traditional, pre-refrigeration food preservation techniques. IMAGE: Verticality of Root Vegetables, Jihyun Ryou. Found via The Ecology of Food. 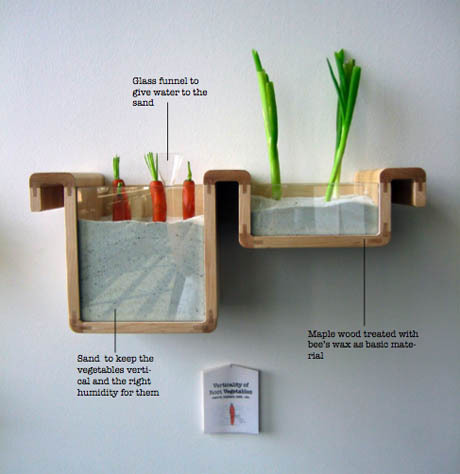 Ryou’s designs rely on information that used to be common knowledge: for example, that root vegetables such as carrots and leeks last longer when buried upright in slightly damp sand, mimicking their growing conditions. Meanwhile, fruit vegetables (peppers, courgettes, and aubergines, for example) benefit from moist storage, rather than the cold and dry environment in the fridge. Before refrigeration and permanently lit hen houses, eggs were a seasonal phenomenon: hens laid their eggs in spring, and they lasted for a few weeks in barns or pantries. 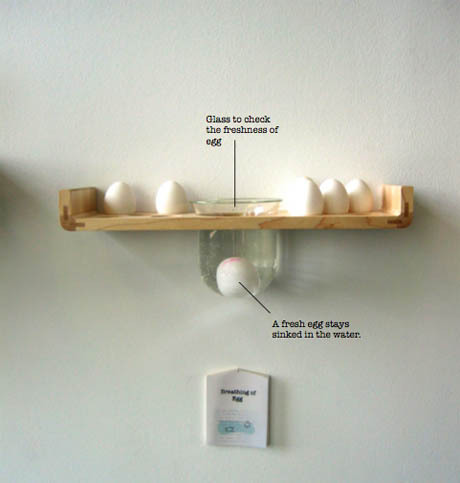 Since most people buy and use eggs within that window, and since eggs stored in the refrigerator easily absorb the odour of neighbouring items, Ryou proposes a separate egg shelf complete with freshness tester (a fresh egg sinks in water). Meanwhile, her apple and potato storage unit takes advantage of the ethylene gas emitted by apples in order to control sprouting in potatoes. In the current food preservation situation […], we hand over the responsibility of taking care of food to the technology. We don’t observe the food any more and don’t understand how to treat it. My design looks at re-introducing and re-evaluating traditional oral knowledge of food. Furthermore, it aims to bring back the connection between us as human beings and food ingredients as other living beings. I believe that once people are given a tool that triggers their minds and requires a mental effort to use it, new traditions and new rituals can be introduced in our culture. Ryou doesn’t call for the complete elimination of the refrigerator, but her idea of redesigning domestic space to suit food (as opposed to redesigning food to suit our appliances) is pretty exciting. Unfortunately, her elegant designs are not commercially available, although they don’t look impossible to recreate with quite a basic set of carpentry skills. This entry was posted in Artificial Cryosphere. Bookmark the permalink. Trackbacks are closed, but you can post a comment. My grandmother was born in 1900 and lived in a small town in Kansas. There were ice boxes (when ice was available), cellars, home grown foods which were preserved by canning, smoking (meats), salt (sauerkraut), sugar (preserves, jam), pickling (eggs, meats, vegetables), dehydrating (most herbs, fruits and vegetables) and preserving root crops in sand, sawdust, and more. She added a refrigerator in her modern new home in Oregon, complete with a small space for ice cubes, which would not keep ice cream overnight. Water freezes at a lower temperature than products with sugar or salt, each a preservative. Her neighborhood had a bakery, butcher shop, post office, hair dresser… all within walking distance. She shopped daily for things near her, or weekly as needed. None of us ever got sick from food eaten at Grandma’s house! Back to old timey ways? Some of my siblings still practice those traditions, because it is practical and delicious. “Refrigerate after opening”? Really, now. Ketchup, honey, mustard, syrup, pickles, jams, anything high in sugar, vinegar, salt will keep without refrigeration longer than you think. Eggs? Butter? Cheese? Not sold in New Zealand or Australia in coolers. Simply buy only what you will use in a reasonable time. In Alaska, we have a short growing season, but lots of daylight so vegetables & some fruits thrive. Chickens, laying hens, geese, pigs, beef, are all possible year ’round with a little extra effort. Friends have a root cellar in which they keep root crops all winter long (and it can -60 degrees F in the deep of winter). I’m excited about the designs which appear to be more art than for practical use. I am going to find a local craftsman to take the principle and make me some for my kitchen!! These are stylish and clever. My wife’s did a bunch of work along the same lines for her thesis at California College of the Arts. Fantastic post (and I really dig your blog as a whole)! Do you know the report “Cooking Up a Storm: Food, greenhouse gas emissions, and our changing climate,” by Tara Garnett of the Food Climate Research Network? (Available here: http://www.fcrn.org.uk/fcrnPublications/index.php?id=6) She includes a really thorough and well-written exploration of how the design of houses has already contributed to the ubiquity of the refrigerator (specifically, in the UK, the decline of a “larder” room separate from the kitchen, which was generally a few degrees cooler). And how marketing by Birdseye and other food companies affected what grocers display in cold storage and in turn what we put in our home refrigerators. Maybe some of this is in Fresh, too, but Garnett’s work is really worth a look. I prefer to store my veg and fruits on the counter; they taste better at room temperature! Jihyun Ryou is very clever – thanks for sharing. When I lived in the Lavapies neighborhood of Madrid, it occurred to me for the first time that I had no idea how to tell what “good” food looked like. I don’t mean taste, even, I just mean like, “Won’t make you throw up.” I grew up in the exurbs where the supermarkets are the largest buildings around. The Spanish meat looked so different from its American cousin that I was flummoxed about what to buy and eat. I’d hold up the packages to my nose and… it just smelled weird. And bad. Not that you needed the extra proximity to your volatile organic compound sensor. You walked in the door and it was just — BAM — trillions of bacteria interacting with meat, happily feasting on it and releasing the smell of life remaking itself with the remains of life. It was usually tolerable but remarkably unpleasant. When I got back to Seattle, I would walk into the QFC on 45th in tony Wallingford and just breathe deeeeeeep. Ahhhh. Now that’s how food is supposed to smell! Like nothing! Every cut of meat looked perfect and marbled. Nothing smelled. You could buy a cake with a photograph printed on it in delicious sugarstuff. America, you will never be worthy of your Trotskyites! One day, later at night because I used to keep those hours, I walked into the QFC and almost fell to the floor gagging. The entire place didn’t smell like meat that was a little ripe, it smelled like the final scraps of rotting zebra flesh that a runt hyena was attempting to pry from the worms. And the weirdest thing was: all these people were in there shopping, hardly even rubbing their noses or nudging their neighbors in snow-day sympathy. It was as if this smell was so unfamiliar and so bad that no one could smell it. They just couldn’t believe that the smell could possibly be related to the polished cracked-cement floors. Fighting my way through the staggering odor, practically leaning on its solidity and potency, I asked a kindly checker, “WTF?” Apparently, it was something [scan] to do [scan] with [scan scan] the grease traps [scan]. This is some kind of tangled metaphor for the American food system. Brutally efficient, free from odors, shiny … until it loses its goddamn mind and marauds through the streets like a rebellious robot. And there’s nothing anyone can do about it. “Food is made of formerly living things!” it cries, shoveling cellophane packaging into its maw. But you just wait, sweep up the shards, and know that a refrigerated Snickers bar awaits you if you keep calm and ignore the smell. Entirely possible in certain contexts. I have been living in Tokyo, Japan for 3 years without having a fridge. And I didn’t regret it. It almost started as an experiment when I moved from Canada to Japan and that I had to throw, sell or give a lot of stuff, because the space in Japan is much smaller. Arriving in Japan, I created a rule for myself: « buy only what you really need, when you need it. » The fridge never reached that level. But it was Tokyo. 1. At 30s from my place, there was a combini (open 24/7), like seven-eleven in USA, but it was only the closest one. There were around 10 in a 5 minutes walk around my place. 2. The size of packages and portions of food is small! That changes also a lot of things. You can buy only what you will consume. No huge pack of milk. Small yoghurt sold individually, etc. 3. There were three small supermarkets with fresh products 2 minutes walking around my place. 4. If you feel not in the mood for cooking, shopping, there are plenty of places opened very late at night (till 3am) for dinner. Some opened 24/7. All of these combined made my life much simpler, healthier and eating fresh products. I think you’d be better off using a root cellar or basement too – but for people who live in flats or houses without such a thing, the moistened sand storage units could provide a pretty nifty alternative. To me, they seem quite practical (as well as aesthetically pleasing), although, of course, without having used them it’s hard to tell. Well those designs are meant to be art, not practical, right? I’d think you’d be better off storing root crops in a cool, dark basement. It’s a very intersting point though. It’s still common in Europe not to refrigerate food like eggs and butter that we always keep chilled in the US – which reflects a real loss in understanding our food.